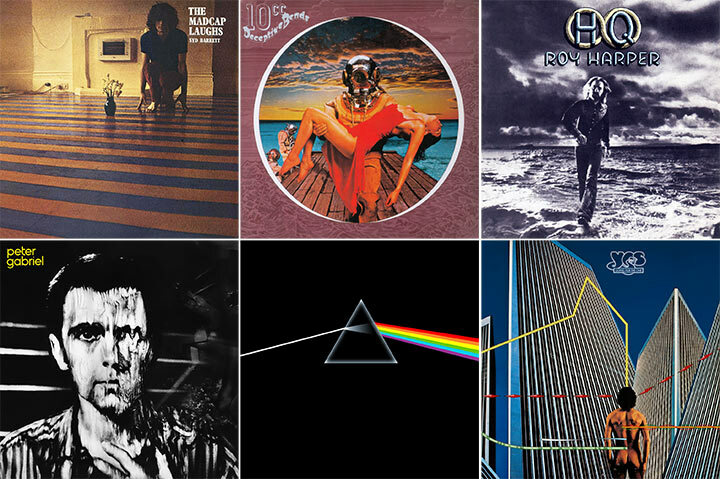 Artwork may be designed to show off music, but some album cover designers have attracted fame thanks to their iconic work. 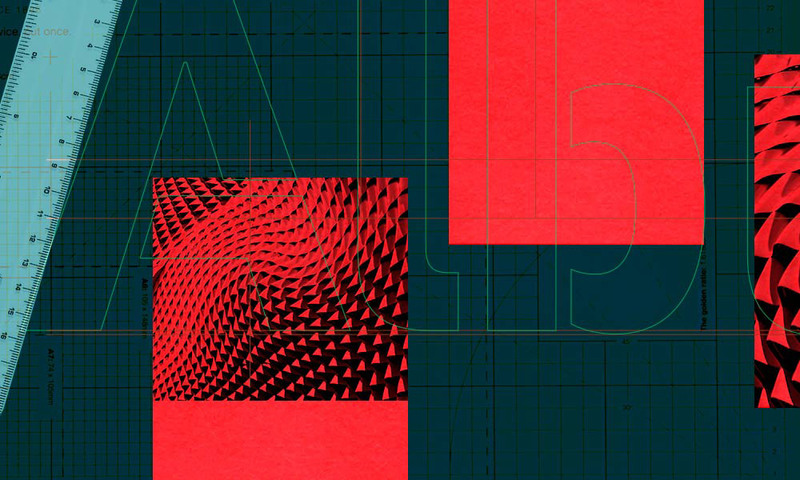 Here we look at 13 of the best. 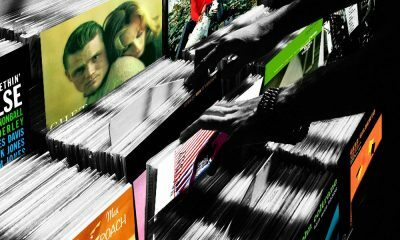 An album’s artwork may be designed to show off a band and its music, but in some cases album cover designers have themselves attracted a degree of fame thanks to their iconic design work. 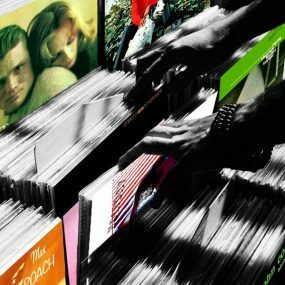 Whether helping to shape the vision of a label, like Reid Miles (Blue Note) or Vaughan Oliver (4AD), or establishing a style that cemented most people’s thoughts of a decade’s worth of music (like Hypgnosis, in the 70s), album cover designers deserve to be hailed for creating mini masterpieces that make an art form out of the album cover. 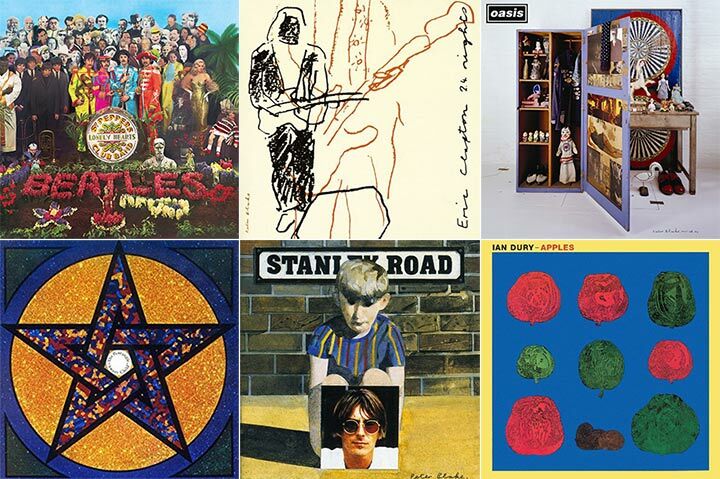 Here we look at 13 of the most iconic album cover designers of all time. The moody photography of Francis Wolff and the artistic genius of Reid Miles became hugely influential in the world of music and graphic design, and turned Blue Note album covers into enduring cultural gems. Chicago-born Miles, who had been an Esquire magazine journalist before working in music, created a “hip” brand identity for Blue Note, which was the epitome of modern, cool and progressive. Miles was not a jazz fan and was thus able to stand back and analyse what would make a great cover, irrespective of the musician involved. 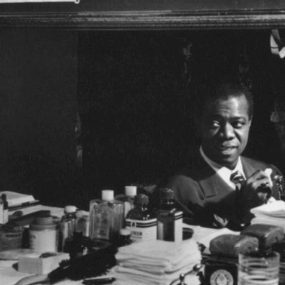 In the 60s, Miles began to concentrate on photography and he became a hugely successful figure in advertising. 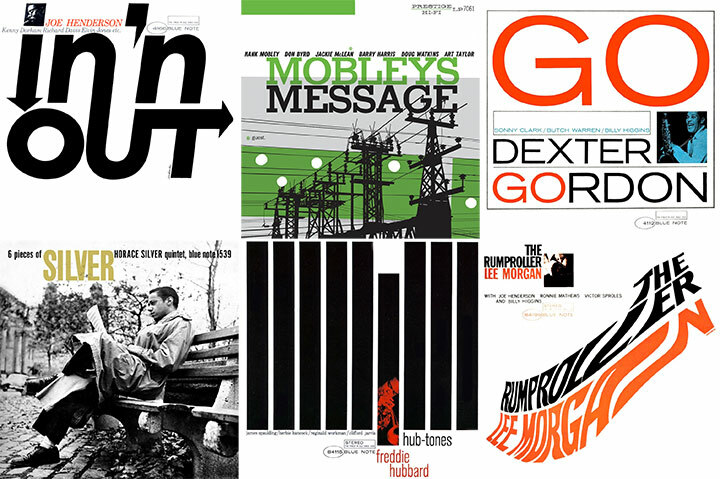 However, his modern jazz designs – some with stunning and wild typographical expression, such as Lee Morgan’s The Rumproller – created a superb legacy, marking Reid Miles out as one of the earliest album cover designers to take note of. Londoner Barney Bubbles, who changed his name legally from Colin Fulcher, trained at Twickenham Art College and worked at Terence Conran’s groundbreaking consultancy, before moving into record design. 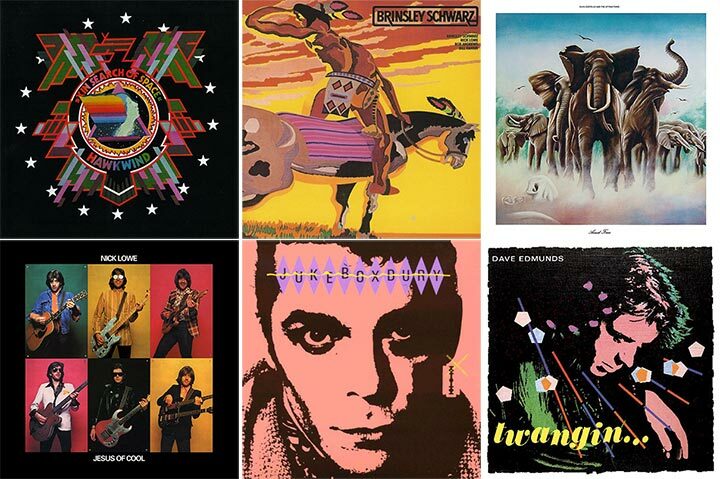 During the 70s and early 80s he created record sleeves, label logos and music-related visuals for innovative musicians such as Elvis Costello, Nick Lowe, Billy Bragg and Ian Dury, for bands such as Hawkwind, and for companies including Stiff Records and the weekly NME. He also worked on music visuals, including the striking Specials video for ‘Ghost Town’. 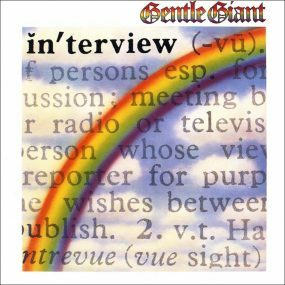 His early work included the cover for the triple-album Glastonbury Fayre, which opens out from a gatefold to a huge six-panel poster. 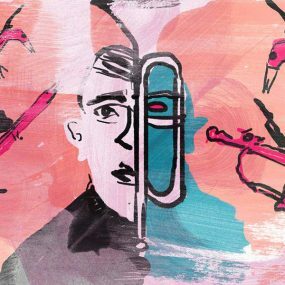 Bubbles would incorporate different art styles and photography – as on the beautiful cover for Costello’s Armed Forces – and created album sleeves of cryptic intricacy. Bubbles, who often worked using obscure pseudonyms (there may be some unknown Bubbles albums still out there), took his own life, at the age of 41, on what would have been his late parents’ wedding anniversary. Hipgnosis – a term mixing “hip” with “gnosis” (meaning “mystic thought”) – was coined by Pink Floyd’s Syd Barrett for the design pairing of English art student friends Storm Thorgerson and Aubrey Powell, when the band asked them to design the cover for their 1968 album, A Saucerful Of Secrets. In the following decade, the company became pre-eminent among the most forward-thinking album covers designers in the world. Their album cover for The Dark Side Of The Moon, featuring white light splitting as it hits a black prism, is one of the most famous images in music. As the desire for lavish album covers waned in the early 80s, Hipgnosis switched to advertising and film work. 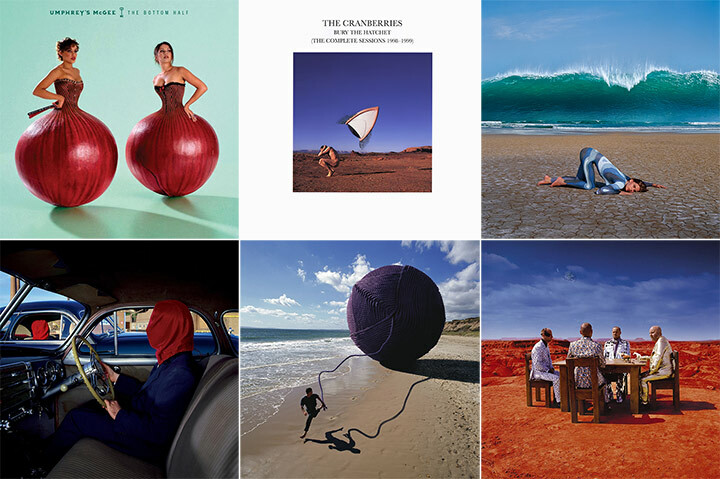 When Hipgnosis came to an end in 1983, Storm Thorgerson started a company making concert films and music videos, including works for Robert Plant, Kajagoogoo and Big Country. The former Cambridge graduate, responsible for so many great Pink Floyd covers as part of Hipgnosis, continued to work on album covers in the 90s, many of which displayed his outlandish photographic images. Thorgerson insisted on doing almost all his photographic shoots on older equipment, largely ignoring the advent of digital technology. Among his latter triumphs were album covers for Catherine Wheel, Phish and The Cranberries. His creativity was not halted by the arrival of the CD, and his design for Pulse, the Pink Floyd live CD, featured a flashing light on its spine. 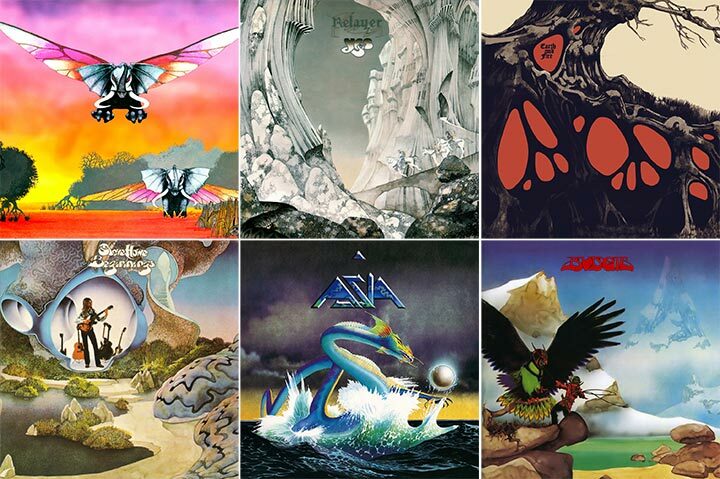 Roger Dean, the celebrated artist, designer, architect and publisher, created some of the most famous prog rock covers of the 70s, especially for the band Yes, starting with the album Fragile. Dean also designed the classic Yes “bubble” logo, which first appeared on the album Close To The Edge. His images were ambitious and unusual. His cover for Tales From Topographic Oceans (1973) was a landscape painting based on English coasts taken from Dominy Hamilton’s postcard collection, mixed with representations of the Mayan temple at Chichen and the plains of Nazca. As with so much of Dean’s great art, the result was incongruous but powerful. 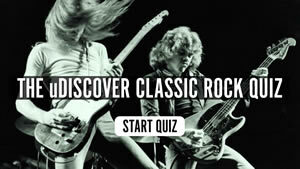 Dean also supplied the original Virgin Records logo in 1973 and based his cover of Steve Howe’s first solo album (Beginnings, 1975) on the landscape seating he designed for Ronnie Scott’s jazz club. 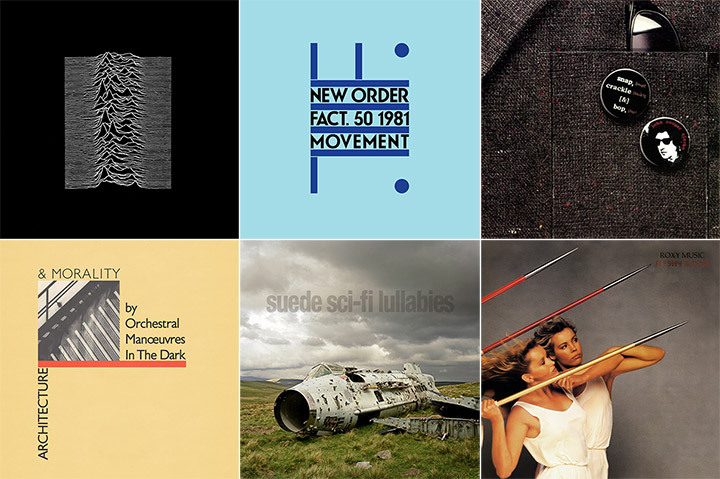 Manchester-born Peter Saville was a co-founder of Factory Records, and though his early work included album covers for several bands, the most celebrated are those for New Order and Joy Division. “I had the opportunity to make the kind of objects I wanted to see in my life,” Saville said about the creative freedom he enjoyed. For his iconic sleeve for Joy Division’s 1979 record Unknown Pleasures, he based the design on the first pulsar, from 1919. 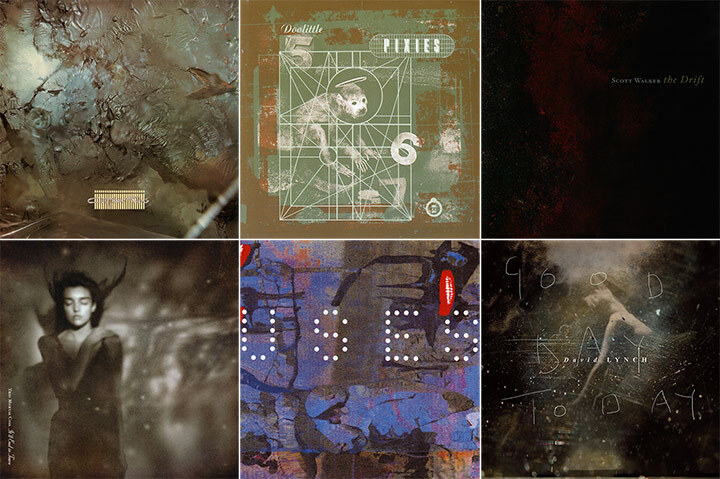 For other sleeves, he used hieroglyphic visuals, juxtaposed antique images with postmodern ones (as on Joy Division’s Closer) and almost always brought to bear his expertise on modern typography. Saville lost interest in album design and went on to numerous triumphs in other fields, including designing the 2010 England football strip, making adverts for Dior and becoming creative director of the city of Manchester. California-born artist Stanley “Mouse” Miller cut his teeth as a hot-rod painting sensation modifying dragster cars. He then moved into designing the psychedelic posters which were a feature of the San Francisco landscape in the 60s. He is best known for being the creator of the famous “skull and roses” logo adopted by Grateful Dead. His work with the Dead continued through many classic albums, including Workingman’s Dead and American Beauty. 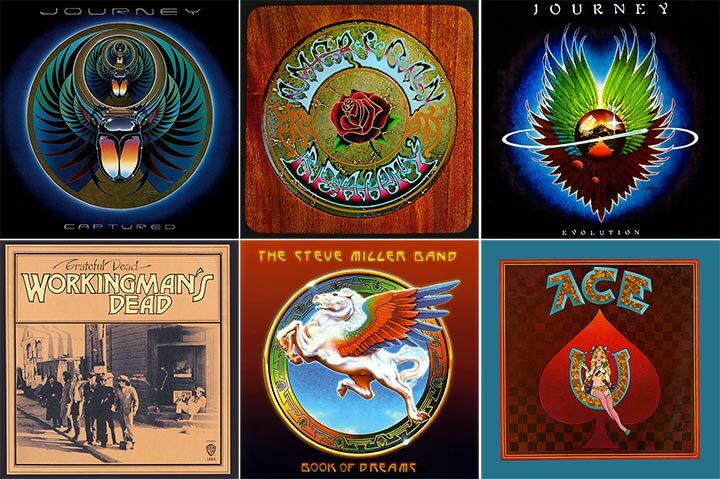 He also designed iconic album covers for Steve Miller and Journey. Chicago-born David Stone Martin studied at the city’s Art Institute before making his name as an album cover designer and artist, something that grew out of a friendship with pianist Mary Lou Williams. 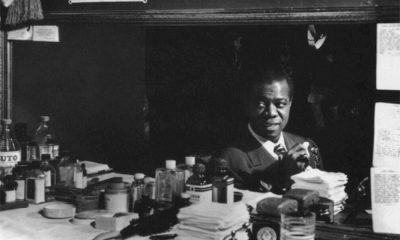 His album portraits, mostly drawn in distinctive, heavy black-ink lines, include Count Basie, Charlie Parker, Billie Holiday, Art Tatum, John Coltrane, Ella Fitzgerald, Dizzy Gillespie, Stan Getz and Duke Ellington. 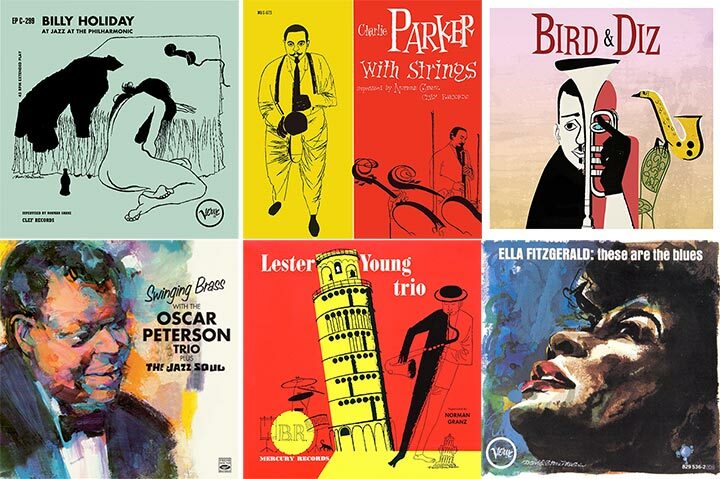 He did most of the covers for the Asch, Clef and Jazz At The Philharmonic releases of the post-war era. Martin went on to create covers for Life and Time magazines, including memorable ones featuring Eugene McCarthy and Chairman Mao. 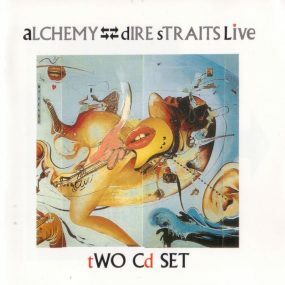 Cementing his reputation as one of the great album cover designers, his work is included in the collections of the Museum Of Modern Art and the Smithsonian Institution. Brooklyn-born John Berg worked as a cartoonist and was hired by Columbia Records in 1961 after a spell working for Esquire magazine. 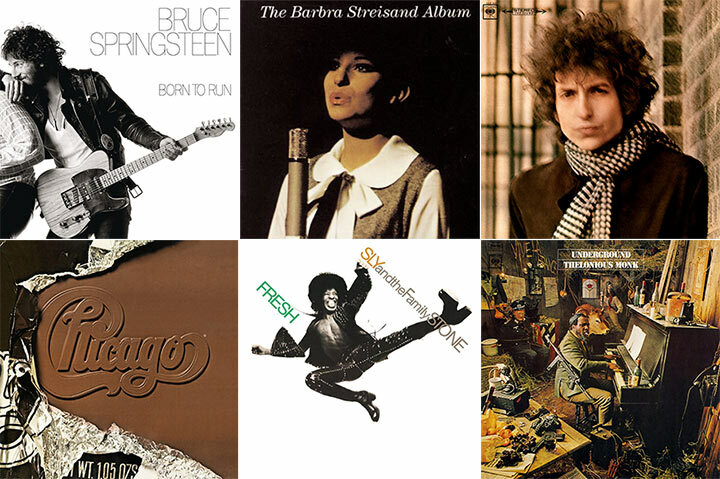 Berg, who had never worked on a record album before, made more than 5,000 artworks over the next quarter of a century, including iconic covers for musicians as diverse as The Byrds, Simon And Garfunkel, Bessie Smith, Bob Dylan and Chicago. As art director he won four Grammy awards and commissioned covers from some of the foremost artists of the period – including Edward Sorel and Tomi Ungerer – and from top-class photographers such as Richard Avedon. His judgement was severe and often incisive. When he was creating a cover for Born To Run he rejected the sombre photograph that Bruce Springsteen had chosen, saying it made the singer look like a “John Updike-type author”. Berg went through the contact sheets and found an intimate image by Eric Meola of Springsteen laughing as he leant on Clarence Clemons’s shoulder. 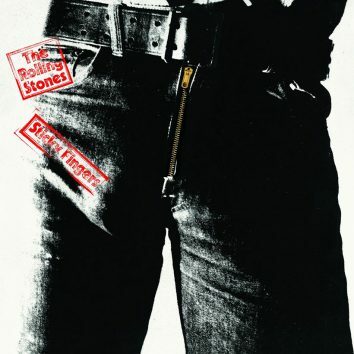 It was a typically shrewd move by Berg – and one of the greatest of all album covers was born. 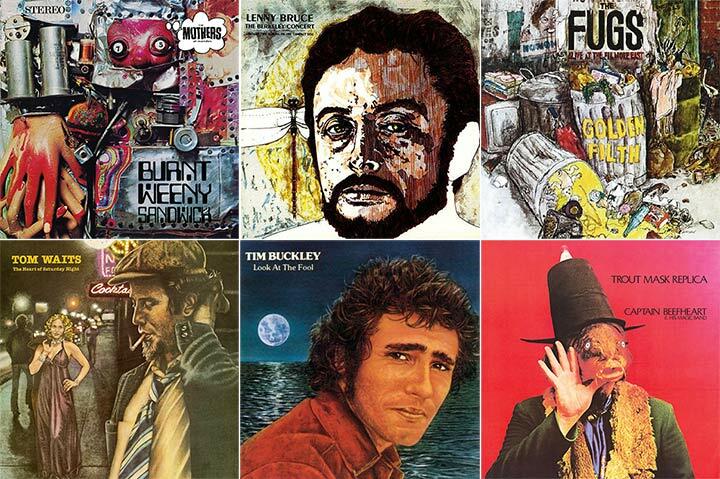 Peter Blake, who has an indelible place as one of the most famous album cover designers in history, actually went into the world of art by chance. He attended a technical school and was heading for a career as an electrician when he decided to take an exam in drawing. He passed with flying colours and was offered a place at an art school in Kent. Blake will forever be associated with his work on one of the most important covers of all time: Sgt Pepper’s Lonely Hearts Club Band. For just £200, Blake turned Paul McCartney’s rough sketch of a bandstand into a three-dimensional set in his studio. The set, which included flowerbeds and statues and a cardboard cut-out of what Blake called “an audience that could include anyone they wanted”, was the setting for The Beatles in their remarkable outfits. Blake later created the cover for the Band Aid single ‘Do They Know It’s Christmas?’ and worked with superstar modern bands such as Oasis. When he designed The Who’s Face Dances in 1981, he commissioned leading British painters, including David Hockney and Patrick Caulfield, to paint portraits of the band members. A rarity among album cover designers, Blake has continued working into his 80s, including on artwork for St Paul’s Cathedral. Click here for an interactive Sgt Pepper cover to discover who’s who. Cal Schenkel was a college drop-out with just a semester of art courses behind him when he met Frank Zappa. He soon became Zappa’s “art engineer”, responsible for a host of fantastic album covers, among them the Sgt Pepper parody We’re Only In It For the Money. He went on to design dozens of albums for Zappa, including Cruising with Ruben & The Jets, and his work was a forerunner of some new wave and punk designs. Schenkel has collaborated with key figures in the musical avant-garde of the modern age, including Tom Waits. When he was working with Captain Beefheart, Schenkel bought a carp from the market, hollowed out the head and affixed it to Beefheart’s face for the cover of Trout Mask Replica. In recent years he has worked for publishing firms. Uniqe among album cover designers, HR Giger won an Oscar for his “xenomorph” creature in Alien, and continued in the film business for more than four decades, including working for Ridley Scott’s 2012 hit, Prometheus. Giger, who had studied architecture in Zürich, also designed video games and worked in interior design. The surrealist Swiss painter was in demand in the music business. 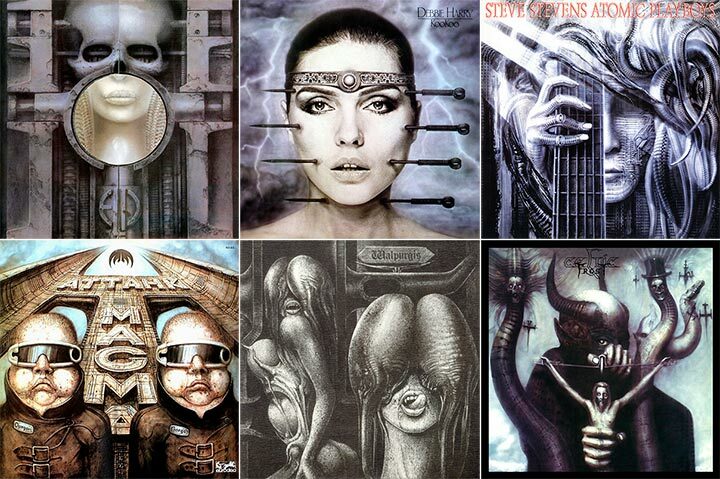 Among his many triumphs were the 1973 cover for Emerson, Lake & Palmer’s album Brain Salad Surgery, which keyboardist Keith Emerson said the band chose “because it pushed album cover art to its extreme”. He also changed Debbie Harry’s popular blonde girl image with his cover for KooKoo, and the singer liked it so much she subsequently hired Giger to design two of her music videos. He died in 2014 from injuries sustained in a fall. Looking for more? 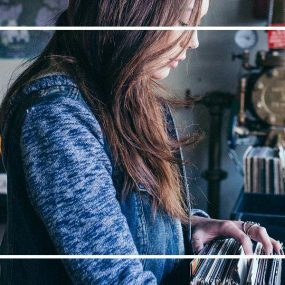 This history of album artwork takes an in-depth look at album cover designers and how their visions have changed the way we listen to music.